Located in the Main Square and built in the Astur Plaza Hotel, the tavern-restaurant is a sign of our philosophy of quality and versatility where you will have a varied offer of products and a wide range of options to eat: snacks, side dishes, menu special, traditional cuisine, etc. Everything with a painstaking attention of our personnel so that your stay is perfect. Here you will find an ideal place to try the traditional food of our town and region. With a rustic-style decoration, we highlight the traditional ceramic oven, where you will taste the milk- fed lamb of the Teleno Mountain. We take care and pick up the traditional products so you know and taste the maragata gastronomy: cecina (sliced cured beef) and cold cut products, good meats of the region, home-made desserts, etc. 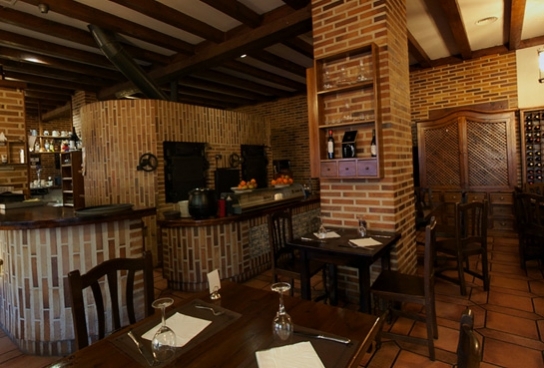 We also offer you the possibility of eating side-dishes or tapas, in one of the classic places in Astorga where to share our choice of dishes, with an appropriate wine selection. Or eating our menu special, where the price will never be incompatible with either quality or variety. Also we offer a suitable menu for the pilgrims' necessities. In hour great terrace in summer, in a privileged place in front of the historic Town Hall, or in its rural style interior, the tavern-restaurant is the best spot in Astorga to rest and enjoy your meals and drinks. Quality and versatility, along with a painstaking attention to offer you an ideal place.